Raise your hand if you love pound cake? How about the berry of love — strawberries? 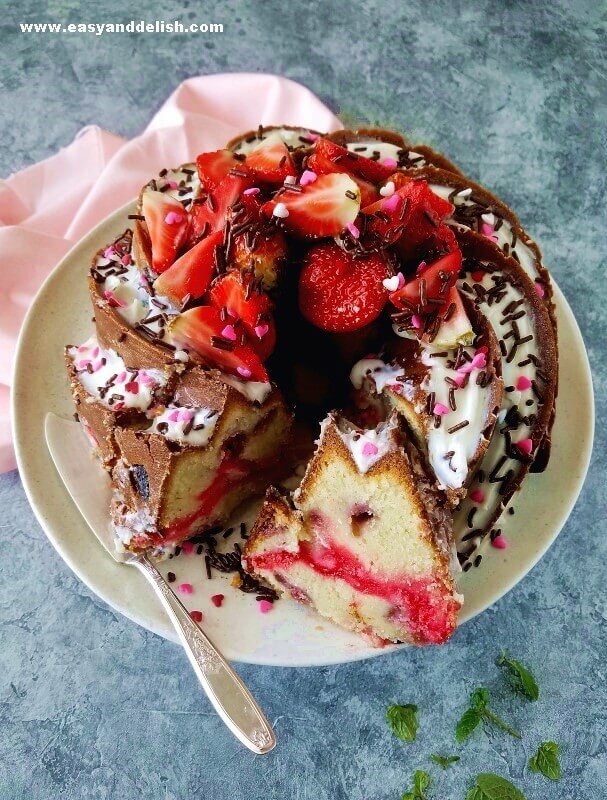 If you answered yes to both questions, then you’ve just got to make this Strawberry Pound Cake. It is moist, delicious, and beautiful! This edible present could put a huge smile on any Valentine’s face. I confess that I had someone more than just my Valentine in mind — myself! 🙂 I hope my hubby doesn’t mind. Our kids were totally happy, too. So it winded up being a treat for the whole family… for my loved ones. … and no one needs a special occasion to treat themselves. Yet, it looks and tastes like a very special treat! The cream cheese pound cake was adapted from the great Martha Stewart. I also folded in chopped strawberries and added strawberry glaze swirls to the batter. 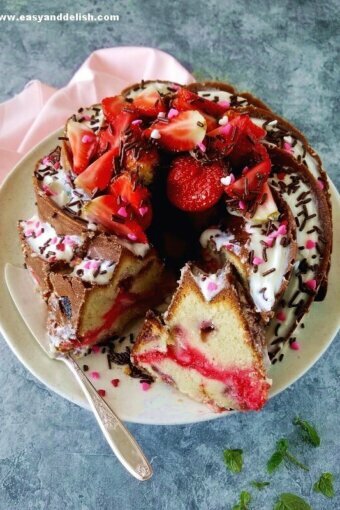 To upgrade this strawberry pound cake, I topped it with a sweetened vanilla cream glaze. It went from simple to posh, as you can see. Don’t you love a “Cinderella” recipe? Preheat oven to 350 F. Grease a 4-quart tube or bundt pan well with butter or vegetable shortening and dust with flour. Set aside. Sift flour and salt in a medium bowl; set aside. 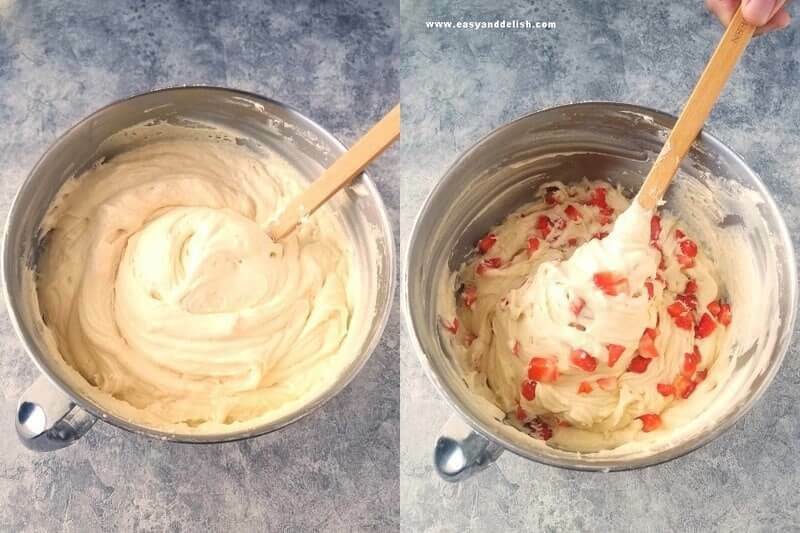 Using an electric mixer with paddle attachment, beat butter and cream cheese on medium speed for 2-3 minutes or until smooth. Gradually adding sugar, beat on medium speed until light and fluffy (approximately 5 minutes). Then, add eggs, one at a time, beating after each addition just until the yolk disappears. Do not overbeat! Mix in vanilla. With mixer on low, add flour and salt in two additions, beating until just combined. Fold in chopped strawberries using a spatula and pour half of the batter into prepared pan. Top batter with 8 spoonfuls of strawberry glaze and make swirls using a toothpick. Pour the other half over top of this. Tap pan on a work surface in order to eliminate large air bubbles. Bake on the middle rack until golden and a toothpick inserted close to the center comes out almost clean, 60 to 70 minutes. If the top of the cake begins to brown too quickly, cover loosely with aluminum foil. Let cake cool for 10-15 minutes in the pan on a rack. Meanwhile, prepare the glaze. In a medium bowl, combine powdered sugar, heavy cream, and vanilla, whisking until smooth. Turn out the cake onto a large plate and place top side up. Once it is slightly warm (not hot), drizzle glaze over the cake and let set. Decorate as desired. I used strawberries and sprinkles. If you love pound cakes, also try our Lemon Coconut Pound Cake. What’s is a Pound Cake? The original recipe dates back to the 1700’s and is from the Southern United States. It used one pound each of flour, sugar, butter, and eggs. It got its name because of the one pound of each ingredient that the recipe called for. Of course, modern recipes show variations both in flavors and the amount of ingredients, making the batter less dense. Measure ingredients precisely. Make sure to level every cup of flour and sugar with the straight edge of a knife or spatula. Why? Because extra sugar causes a cake fall, while extra flour makes it dry. Ingredients must be at room temperature, such as the butter (for creaming) and the eggs (for rising). 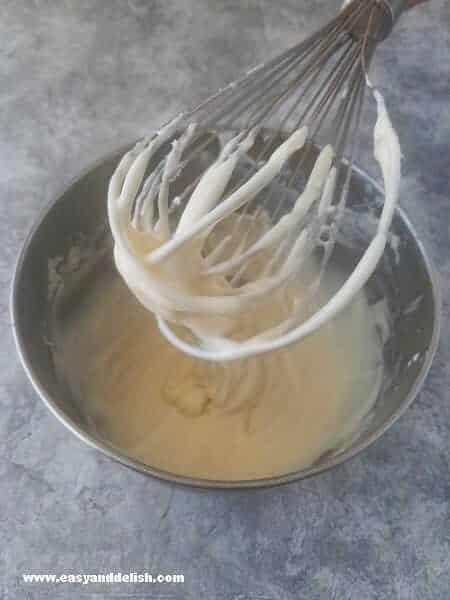 In order to whip air into the cake batter and to have the cake rise during baking, butter must be beaten until creamy; then, sugar must be added gradually, and beaten until mixture is light and fluffy. Add eggs one at a time and avoid overbeating. Otherwise, cake may develop a fragile crust that crumbles as it cools. Alternate dry with liquid ingredients, beginning and ending with the dry ingredients. This will prevent a curdled batter! Grease cake pan well and make sure to either dust it with flour or line with parchment paper. This will help batter to rise to its full volume. Bake cake in the center of the oven, and keep the door closed, otherwise this can cause cake to fall. Let cake cool for 10 minutes, allowing it to firm up. Cooling cake for too long in the pan makes it damp and makes it stick to the pan. If you would like to skip the cream cheese, substitute 1/2 cup of whole milk for 8-ounce cream cheese. Once creaming butter and sugar and then adding eggs ,one at a time until uniform, alternate milk with flour — starting and finishing with flour (e.g. flour, milk, flour, milk, flour). Keep in mind, pound cake won’t be as moist and tender as if with cream cheese but it’ll still be delicious. 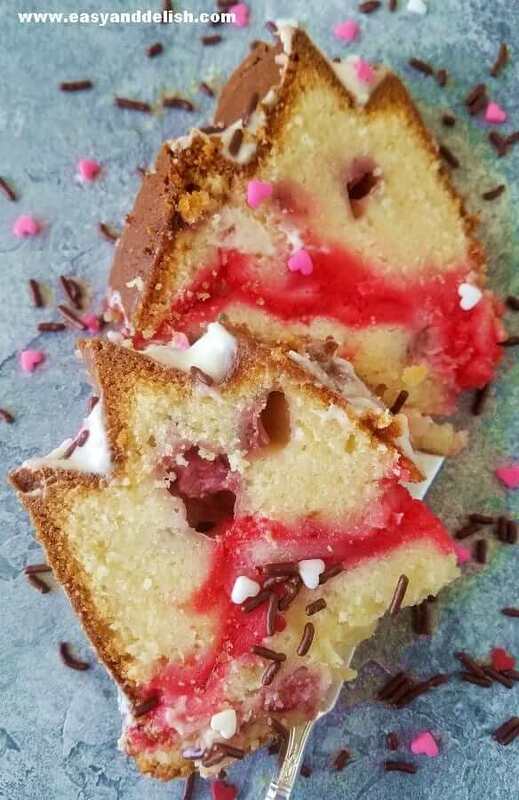 This Strawberry Pound Cake is a super moist cream cheese pound cake with strawberry pieces, topped with a vanilla cream glaze. Its the "it" treat for Valentine's Day or just because! Sift flour and salt in a medium bowl; set aside. 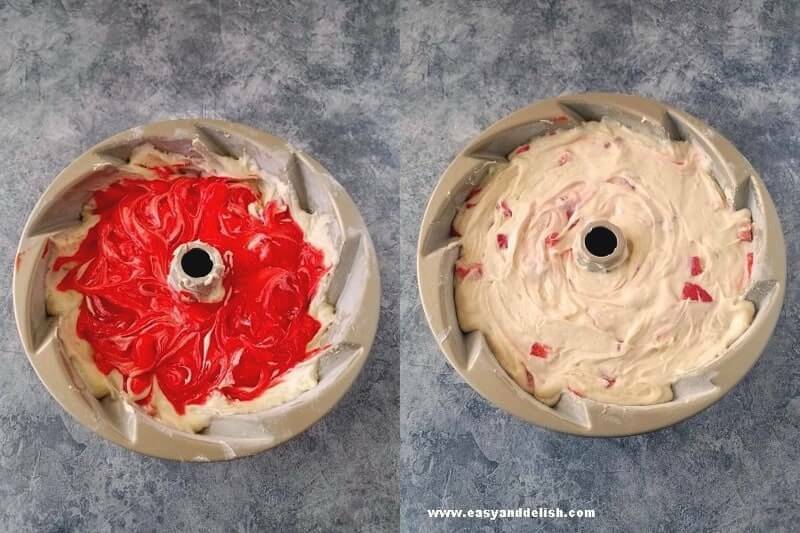 Using an electric mixer with paddle attachment, beat butter and cream cheese on medium speed for 2-3 minutes or until smooth. Gradually adding sugar, beat on medium speed until light and fluffy (approximately 5 minutes). Then, add eggs, one at a time, beating after each addition just until the yolk disappears. Do not overbeat! Mix in 2 tsp vanilla. With mixer on low, add flour and salt in two additions, beating until just combined. Fold in chopped strawberries using a spatula and pour half of the batter into prepared pan. Top batter with 8 spoonfuls of strawberry glaze and make swirls using a toothpick. Pour the other half over top of this. Tap pan on a work surface in order to eliminate large air bubbles. Bake on the middle rack until golden and a toothpick inserted close to the center comes out almost clean, 60 to 70 minutes. If the top of the cake begins to brown too quickly, cover loosely with aluminum foil. Let cake cool for 10-15 minutes in the pan on a rack. Meanwhile, prepare the glaze. In a medium bowl, combine powdered sugar, heavy cream, and 1/2 tsp vanilla, whisking until smooth. Love pound cakes? Also try our Lemon Coconut Pound Cake. If you would like to skip the cream cheese, use 1/2 cup of whole milk instead. Once creaming butter and sugar and then adding eggs one at a time until homogeneous, alternate milk with flour -- starting and finishing with flour (e.g. flour, milk, flour, milk, flour). Keep in mind, cake won't be as moist and tender as if with cream cheese but it'll still be delicious. Even though its only January I’m already looking forward to local strawberry season. 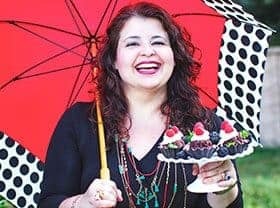 This is such a decadent berry dessert! 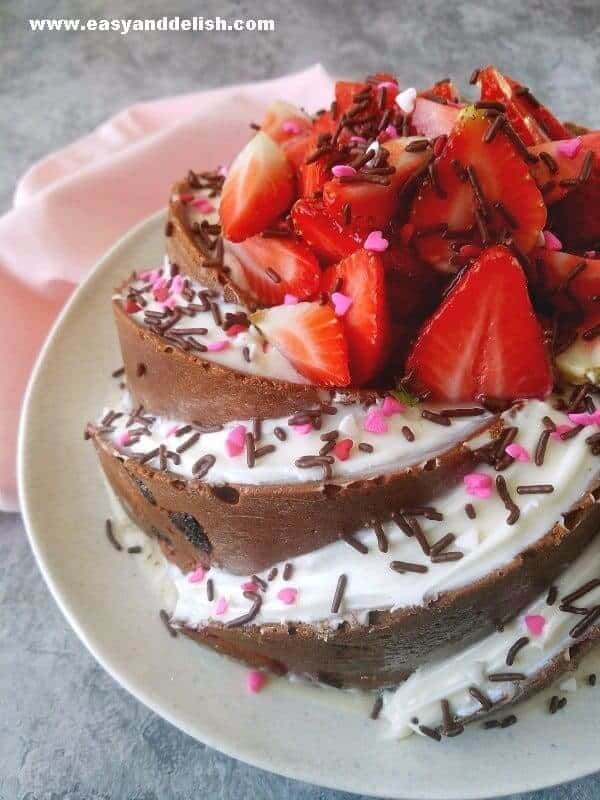 It is a great cake for V-day. Since strawberry is available all year round here, I made with fresh strawberries but you can make with frozen ones if desired. Wow, this looks wonderful! It’s below zero here, so this is a nice taste of spring. Terrific recipe — thanks. Thank you! It is my husband’s favorite cake. If I had made an extra cake, he would have taken care of it by himself. Hi Angie! This is my husband’s favorite pound cake. If you don’t want to use cream cheese, use 1/2 cup of whole milk instead. The right way to incorporate the milk is by alternating with the flour. Cream butter with sugar, add eggs one at a time, and when you are adding the flour alternate the addition with the milk. The dairy ingredient helps to tenderize the cake. Keep in mind that it won’t be as tender as if with cream cheese but still it will be good. Well enjoy!